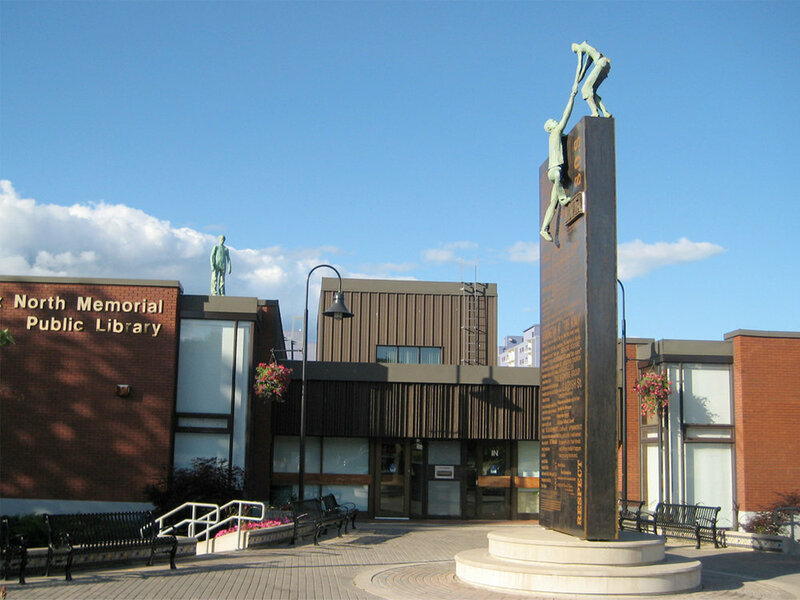 This monument chronicles the rich history of the community surrounding the Halifax North Memorial Library, the neighbourhood known as the North End of Halifax. Conceptualized and realized by a collaborative team made up of Stephen Brathwaite, George Elliott Clarke and Douglas Bamford. Stephen Brathwaite lead the way on the figurative component. Casts taken directly from students from nearby St Patrick’s School become permanent players in the daily drama of one person helping the other through life’s trials, while a youth firmly planted on the library looks on. George Elliott Clarke wrote the namesake Poem “North is Freedom”. Clarke grew up in the neighbour hood and his first job was at the library. Clarke’s short tomb speaks directly to the past and future hopes and dreams of this community, seated in the Library. Douglas Bamford designed and oversaw fabrication of the monolith that the male and female figures are mounted on. The surface of the monolith carries information about the neighbourhoods history. The focus being more on its history after Africville and not it’s Colonial Garrison History. Over a six month research period Bamford met at the Library with numerous community organizations and individuals including teen leadership group, children’s reading group, women’s groups, local poets and writers such as Shauntay Grant and David White who all graciously volunteered writings. These collected bits of information are arranged in a grid composition to refer to a city street scape. The words are etched deeply into the CorTen Steel surface to form a patterned, textured surface of the monolith. The CorTen Steel was chosen for the beautiful rich rust patina that forms as it ages. As a result of this community research a permanent wall of historical and personally relevant stories, poems and even a recipe, cut directly into the steel. 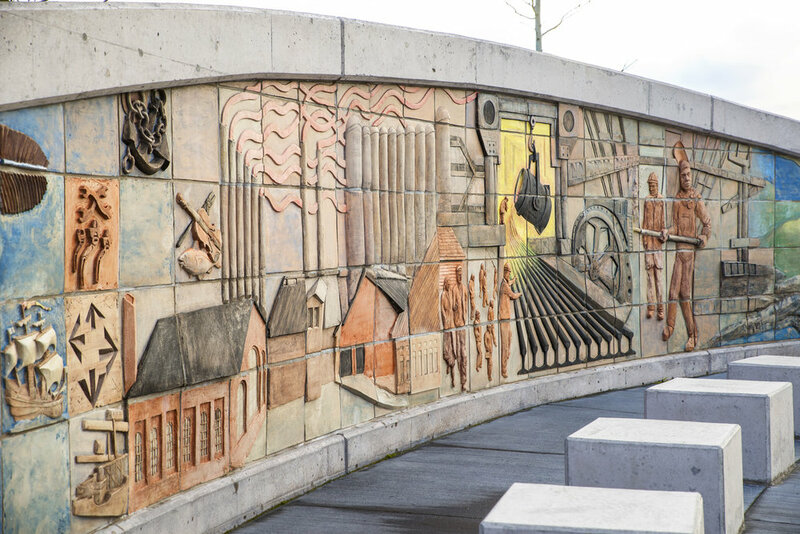 The combination of the figures, “North is Freedom” poem and the bits of history, this work has emerged a deeply integrated and meaningful beacon at the center of this historical neighbourhood. Johnny Miles is a “Local Hero” from Sydney Mines in Cape Breton, Nova Scotia. 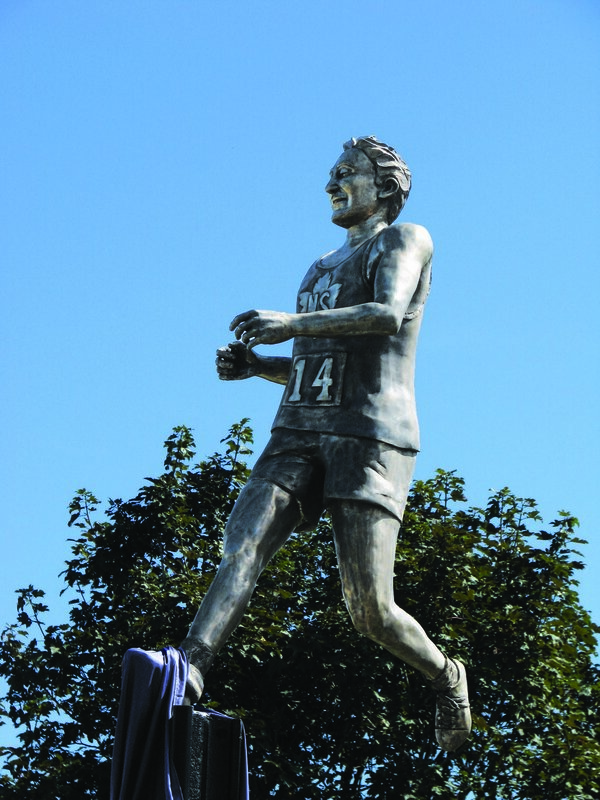 The project was to create a larger than life heroic figure of the two-time winner of the Boston Marathon in the 1920s for the town of Sydney Mines. The figure is a bronze cast of the runner triumphantly crossing the finish line in the famous race of 1922. Johnny Miles strides proudly atop of a column fabricated from four railroad rails rolled in the mill in Sydney Nova Scotia, where his father, also his coach, worked. Regina Lace was commissioned by the City of Regina to celebrate the diversity in groups of immigrants that came from all over the globe to make up the city’s vibrant fabric. As part of my research, I visited many different ethnic groups and documented decorative patterns found on artifacts found on ceramics and textiles lovingly brought to their new homeland. With these various patterns, I created“Regina Lace”, a new pattern that speaks to the unity of diverse groups making up the new urban fabric of Regina. I gathered stories from participants that speak to the courage and trials of leaving home, often under great duress and hardship, to come to a new place and the triumph of making it home. The Lace and the stories were cut through 3/4“ core-ten steel to form a large greeting card with the new Regina Lace featured at the top.In front sits a happy young woman recently arrived from Nigeria to take her place in the community. I found numerous volunteers, including Native elders, newly arrived immigrants, and descendants of earlier settlers to be models for the figures, representing a wide scope of diversity. These people were then cast in plaster to become lasting bronze partial figures or figurative abstractions. It is this process of research coupled with community involvement that is at the core of my art-making practice and key in creating art that the whole community can identify with and take ownership of. Click here to see video of Regina Lace. Commissioned by The Sydney Tar Pond Agency to depict the history of the site of the former Sydney Tar Ponds and commemorate its transformation from environmental disaster to clean recreational land. The bas-relief mural reads from left to right. The narrative begins with a depiction of the lands under native stewardship symbolized by large eagle feathers floating in the sky as cloud forms. Moving on to the arrival and colonization by Europeans. It then illustrates the development as one of North America’s largest centers of steel production, that created and left in its wake the infamous environmental hazard know as The Tar Ponds. It concludes with imagery of the transformed lands into the new Open Hearth Park, now a very popular public space for the people of Sydney. I worked with a strong team of recent graduates from the NSCAD Ceramics program to execute what is Canada’s largest outdoor Ceramic Mural. Sydney Steel was laid out and fabricated on a full scale 50’ long easel in a warehouse space on the Halifax waterfront, After the piece was drawn out full scale we were able to grid the drawing up and map out the detail in every grid sector. Large tiles were made and the drawing transferred to each of these. A combination of carving into the surface and adding clay to build up the relief made for a lively composition.